I will be taking a little break from posting this week as I have my last exam this year coming up on Friday! And as of the 15th of June, Hijab Style will be coming to you all the way from sunny, sunny Lebanon! I'll be flying out there for a couple of months, inshallah. Blogging wise, this will be a great opportunity to discover Lebanese hijab style; the lack of which I've lamented in a previous post here. Now to be honest, I'm not exactly sure how much Internet access I'll have (and I have to admit, I'd much rather spend my time enjoying the sunshine than behind a computer screen). However, I do have a lot of material saved, so I'll make use of scheduled publisher to keep posts going inshallah. 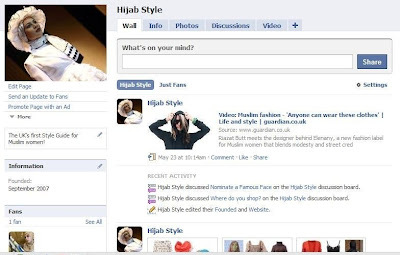 In the mean time, I've finally got round to publishing the Hijab Style fan page over on Facebook. Do join and take part in the discussions, and feel free to start your own! It should be a really good place for everyone to discuss things easily in one place, and get any questions answered. And don't forget to invite your friends! Ah, maybe you will find a beach with a hot spot and then you can take your laptop and bake two dishes - yourself and your blog - in one oven? :D:D:D Seriously, cool beans that you have this opportunity to travel, and may you do well on your exam insha'Allah! Good luck on your exam Jana and have a fab holiday! Hope u enjoy ur holiday inshallah and wish the best in ur exam..
All the best for your exams! Enjoy your holiday :D! enjoy your holiday in lebanon and also good luck 4 your exam!!! I am doing my last exam too to enter university.... I hope we will pass them inshallah..
HI there! thank you for your comment :) your blog soo lovely, like it. by the waay GOODLUCK for your exam! viel gluck! gonnahave a better look when i'm home from work inchallah. Good luck! May Allah (swt) grant you tons of success!